Recently my husband asked me why I hadn’t made a certain dish in a while. My answer was that I was trying to cook like a farm wife by focusing on the ingredients from our farm, whereas the dish he wanted featured spinach, which I don’t have great luck growing. My husband and I run a small organic farm, Downstream Farm Organic Produce, about 8 miles west of Fayetteville on Clear Creek. We mostly grow food for ourselves and sell the extra produce to friends, restaurants, and Ozark Natural Foods. We raise chickens and grow vegetables like okra, tomatoes, tomatillos, bell peppers, and too many others to name. 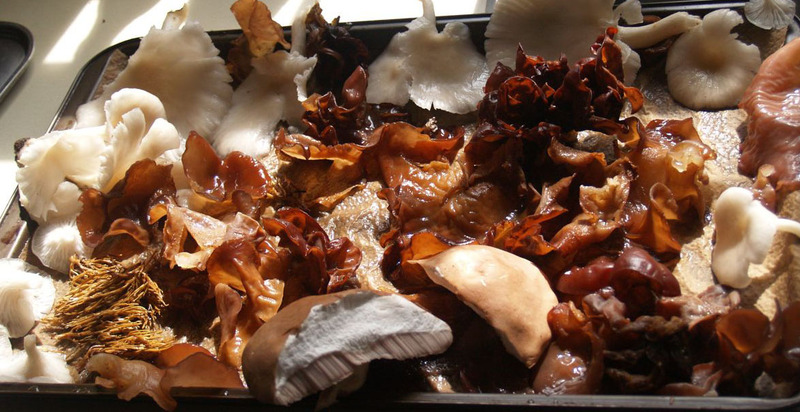 Oyster Mushrooms, Wood Ears, Coral Fungus, and Boletes. FYI, I didn’t eat all of these mushroom varieties. Recently, my husband found a bounty of wild mushrooms, including oyster mushrooms and wood ear mushrooms, so I made a special dish to feature them. 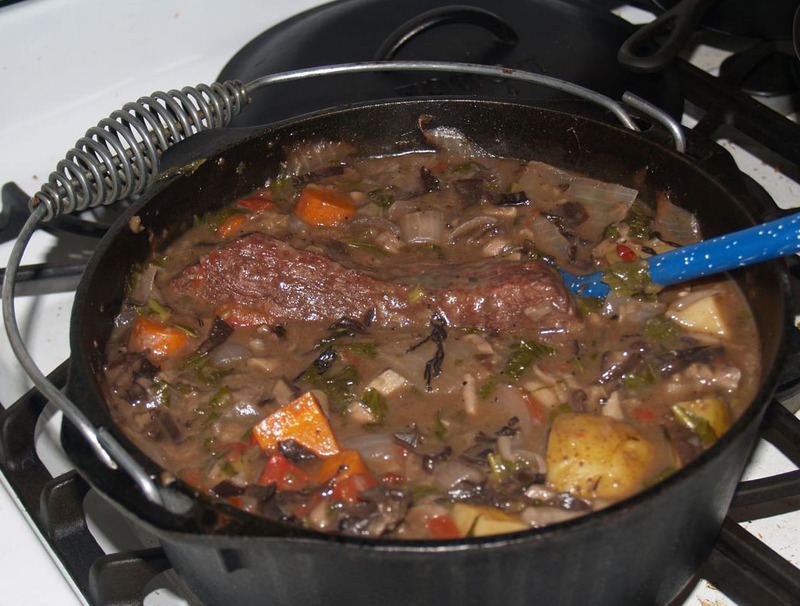 My venison and wild mushroom stew also included our venison, radish greens, fresh herbs, and tomatoes. Not all ingredients have to be from the farm. For instance, this farm wife happened to have some red wine around. The carrots and potatoes were also from the store since we had run out of our own a few months ago. I know that everyone can’t grow as much of their food as we do, but you can still incorporate some of my thinking into your own cooking by focusing on local and seasonal ingredients. Local foods can be fresher and therefore higher in nutrients. Seasonal ingredients tend to be more affordable and often shipped shorter distances so fewer resources are used to get them to us. I try to avoid buying certain summer foods, like melons, in the middle of winter when the only ones available have been shipped from South America or even further away. And these foods aren’t necessarily appropriate for our bodies during the winter. It makes sense that we need cooling foods like melons and cucumbers in the summer and warmer, higher calorie foods in the winter. Part of my process is to be creative with substitutions. For instance, I still look at recipes to get a basic framework for a dish, but readily add or subtract vegetables and other ingredients based on what is available at that time of the year. I also focus my cooking on nutrient dense foods, as in foods that provide a lot of our necessary vitamins and minerals per calorie. Or in the case of the wild mushrooms, add medicinal benefits to the dish. Nearly all culinary mushrooms strengthen the immune system and help reduce inflammation. Oyster mushrooms may also help lower cholesterol. Consumption of mushrooms like these may help prevent cancer, partially because of the beta-glucans they provide. Oyster mushrooms are fairly commonly available in stores, so you don’t have to find them on a log after the rain like my husband did. And you can grow your own using a mushroom kit or mushroom logs. Since some mushrooms are poisonous don’t eat wild ones unless you know them well like my husband does. This entry was posted in Health and tagged antioxidant, cancer prevention, cardiovascular disease, cardiovascular health, cholesterol, cholesterol lowering, eating local, food, health, immune support, inflammation, local food, nature, nutrition, oyster mushrooms. Bookmark the permalink.